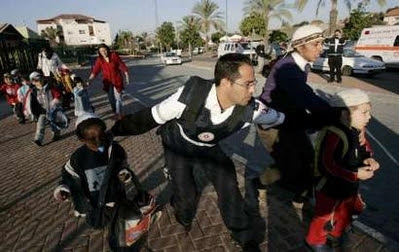 This Ongoing War: A Blog: 2-Apr-13: Gaza's rocket-rich terrorists managed to hit an Israeli kindergarten. Thankfully, no children were there but that was not the jihadists' plan. 2-Apr-13: Gaza's rocket-rich terrorists managed to hit an Israeli kindergarten. Thankfully, no children were there but that was not the jihadists' plan. Passover ended in Israel about 24 hours ago (it's in its final hours now in some parts of the Jewish diaspora) and in its honour, all Israeli schools and kindergartens were closed. This turns out to have been a very good thing, because in the southern half of this tiny sliver of a country, the remains of a terrorist missile were found today in the grounds of a kindergarten. Because it fell during the Passover break, thankfully no little children were injured. Nor was anyone else but as we keep trying to explain, that was never the intention of those who fired it. We write this kind of piece (to state the obvious) because facts and events like these go almost entirely unreported. Most people, even those concerned about the welfare of the people making their homes here, simply have no idea.